rated R (for strong graphic bloody violence, sexual assaults, grisly images and language)1 hr. 33 min. Let’s get this outta the way right from the start. I like the Rambo films. It’s not a guilty pleasure either nor is it cuz I like particularly violent films. I like them solely because it’s one man taking on injustice and the violent atrocities of man. I’ll admit, the character of Rambo become more and more out-of-control as the sequels were released. He became more and more buff, put in impossibly outnumbered combat situations and escaped certain death countless times. The icon of Rambo became crazy with all the political mumbo-jumbo of the Reagan surrounding the second sequel, “First Blood: Rambo Part II”, not to mention all the merchandise like action figures and cartoons. Ugh! Everything about the character got out-of-hand. No wonder everyone made fun of Stallone for his muscle-bound, seemingly muscle-headed role. Still, “First Blood”, the first Rambo move was awesome! I was a lil over 10 years-old when I finally saw that 1982 film (unbeknownst to my mother) and it certainly left an impression on me. It was the action but soon after I realized Rambo’s sensitive backstory. Yes, I included sensitive and Rambo in the same sentence. Here was a decorated Vietnam veteran, whose war buddies were all dead and found no place or function in society. He was trained by his country to be the ultimate weapon, the perfect warrior, but came to realize he had no place in his country anymore. It was one of the first movies where you saw a veteran at war with his own country. That still is a cool concept for me. Unfortunately, what began as a franchise of high adventure and sympathy for the underdog and the veteran protagonist became a feral cartoon. 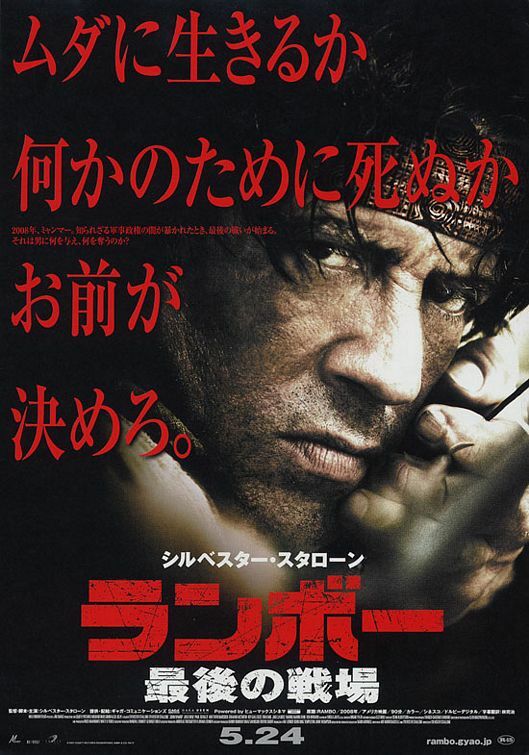 Now, 20 years later, “Rambo” comes full circle finding its rightful home in utter bloody chaos. We find John J. Rambo (Sylvester Stallone) in Thailand where he was at the start “Rambo III” working as a boatman and snake wrangler. He’s away from America, away from any politics and trying to lead a life of solitude while evading his demons. A group of Christian missionaries find the battle-scarred loner and ask him to drive them up the river to the heart of the Burmese civil war in order for them to deliver some hope to the villagers there. Rambo knows better. He knows without weapons the war zone up north will not change despite anyone’s good intentions and actions. Rambo knows this and director Stallone shows us in the beginning previous scenes the atrocities of the Burmese military committed onto their own people. Villagers are mutilated and beheaded while a truckload of villagers are forced to walk in a swampy minefield while the Burmese soldiers place bets on who might survive. When the movie title appears in blood-red, we know that these oppressed people will have their rescuer and the dead will be avenged. But right now Rambo’s not budging. He turned down the request of missionary leader Michael (Paul Schulze) which gives his spirited girlfriend (the only gal in the group) a chance to persuade the hulking loner. Either something she says stirs him or he just hasn’t seen a cute blond like Sarah (Julie Benz) in quite a while cuz we next a reluctant Rambo steering the group up the river. On their way, the group witnesses how dangerous both the river is and their quite guide is, as they see how Rambo deals with pirates. This doesn’t sit well with Michael and once they arrive he lets Rambo know he won’t be needed on the way back as they plan on returning by land. Returning home alone, a conflicted Rambo thinks about what Sarah told him about making a difference in people’s lives while wrestling with what he is, a warrior. When he’s visited by a Colorado church pastor (Ken Howard) he knows the missionaries are in trouble. He asks Rambo to lead a group of mercenaries he’s hired (wuh?) to the village to rescue them cuz communication has been cut off and we know why. We were shown the vicious Burmese military obliterate the village where the missionaries are, cutting an unbelievable path of genocide. Woman are beaten and raped, limbs are cut off, children are stabbed or shot at point-blank and thrown into a fire if their not old enough to join the military. Bodies explode near the missionaries as the try to evade death or capture. Amid the carnage, Sarah and Michael and another missionary are captured and taken away. This leaves Rambo in a position to turn his back or assume his psychologically tattered solider mentality and launch into battle once again. Of course, it’s obvious what he does. He does what he does best and he doesn’t allow a band of mouth mercs get in his way. These mercenaries don’t know what to make of Rambo until they actually see him in action and then they follow his lead. Yes, once Rambo turns on his military mojo the film goes crazy! It explodes with a hurricane of aggression aimed directly at those clueless Burmese soldiers. Wave after wave of bloody fury assault us as Rambo turns predator in a very dynamic manner that explodes across the screen with all the horror and fist-pumping that is expecting in franchise. Stallone serves up an insane amount of gore in the film’s finale (amplified with rickety CGI), and I gotta say I commend him for the fearlessness of the realism of it all. Sure, it’s uneasy to look at, it’s assaulting after all. But Stallone has built up the enemies despicable actions enough where you just hold on in your seat and go along with him. This is probably the first Rambo movie where you really feel what it would be like in the heat of battle. There’s no shirtless, slo-mo shots (thank you!) with Rambo jumping over a gorge with a blasting M60. Stallone is going for the heart of darkness here, exhibiting this decades long civil war that most don’t know about on very realistic terms, stunning viewers with real depictions of death and carnage. He’s said in interviews that if he were to do another Rambo film, it would have to be socially relevant to some existing injustice. This film doesn’t recoil from any of it, displaying a gruesome reign of death and unspeakable acts of violation. It’s a bleak perspective and Stallone perhaps distances himself from the mindless body count craziness of the two earlier films by coming closer to authenticity. It still may seem overboard to some, but putting the viewer in the middle of pure hell really drives home a vivid theme about the futility of peace and war. Fighting slaughter with slaughter is exhilarating, but Stallone shows us there’s an unavoidable price to pay. Unlike Stallone’s return to his other iconic character in 2006′s “Rocky Balboa”, this film isn’t about healing any old wounds nor is it necessarily a return to the melodrama underneath the first Rambo film. It’s not the superficial action romp that most have come to associate with the character either. It seems Stallone is hungry to prove a point this time around, and he unleashes a torrent of violence in a manner that’s just plain berserk. 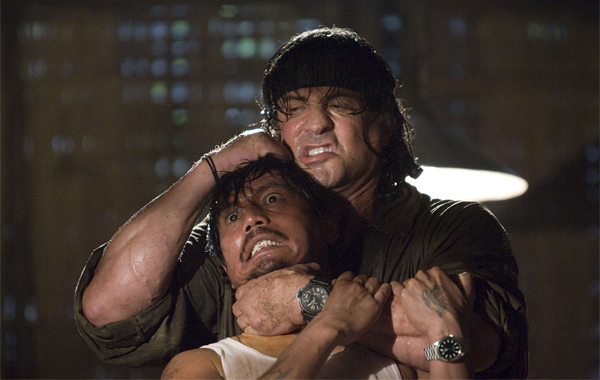 It cannot be stressed enough: “Rambo” is a monumentally vicious film. Is it odd to see a hulking Stallone in his 60′s run through the jungle like a runaway rhino? Nope. I like the idea of him not being the lean machine he once was and I find that time away from the character can bring an added dimension to the role. There’s much talk about how absurd it is for actors at this age returning to such physical roles but this is nothing new in cinema. John Wayne did it, so did Lee Marvin and James Coburn, why not Sly? After all, coming back to what became such a cartoon character at this age brings about a needed maturity. 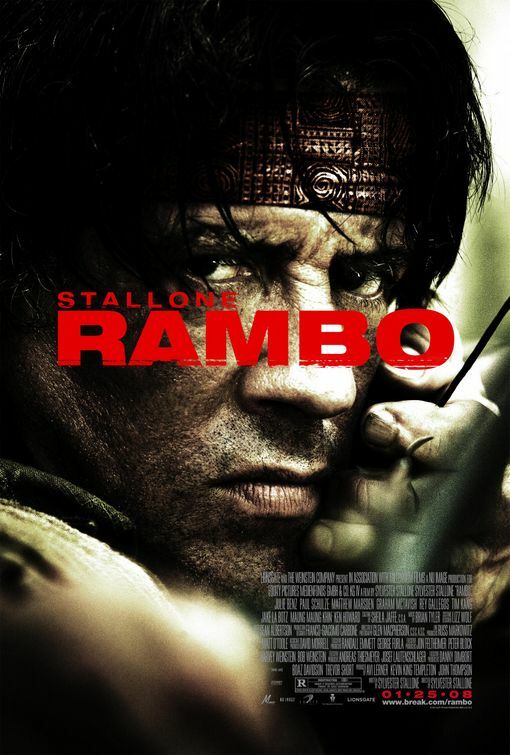 It seems that during this considerable downtime, Stallone has reassessed his work as John Rambo and his iconic screen history, and is comfortable raging again in this ruthless exclamation point on a surreal series of films. 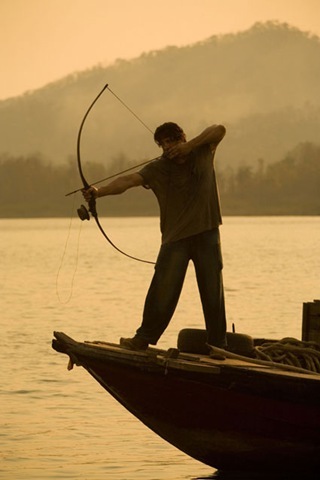 The film concludes Rambo’s mournful journey well enough for me although it was way too short. Still, I’d be fine with it finally ending here. Then again, studio head Harvey Weinstein is quoted as liking the opening weekend numbers, so he might be pushing Stallone for another one. That’d be a mistake but a part of me would be curious. Stallone is far from my favorite actor but I do like the guy. He’s funny, intelligent, self-deprecating and humble. I know….you’re stunned. Back in the day we all loved the original FIRST BLOOD, and anxiously awaited the sequel. The teaser trailer for RAMBO: FIRST BLOOD PART 2 played in theatres for what seemed liked years! I think they started playing that thing before the movie even went in to production, which at the time seemed crazy…and was torturous. I’d give “Inception” 4 stars but Paul already did.